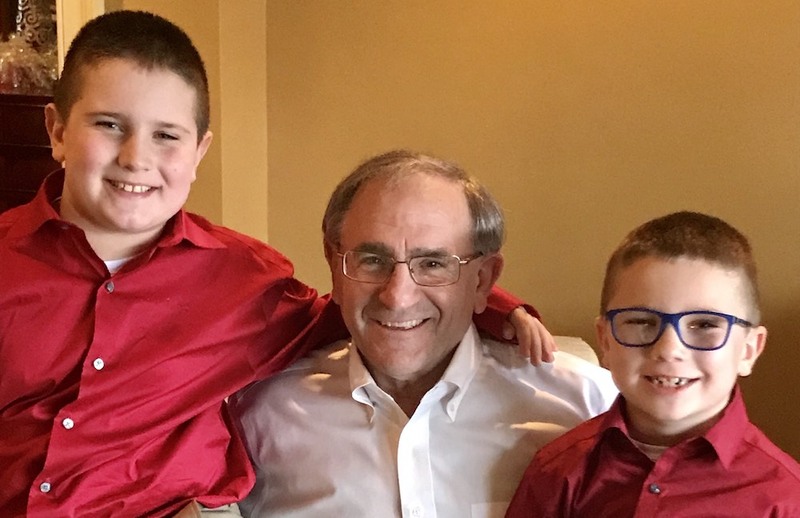 Ed Morascyzk, his daughter Angela, and his grandsons Dominic and Dante have seen firsthand how far science has advanced from generation to generation. The Morascyzk family’s experience with genetic testing for inherited retinal diseases (IRDs) was just one more way they continuously put their loved ones and their community first. Ed received his original clinical diagnosis of degenerative vision loss when he was in his early 30s. During a routine eye exam, Ed’s ophthalmologist mentioned he was beginning to show physical signs that looked unfamiliar and recommended that Ed pursue an additional work up for what was speculated to be retinitis pigmentosa (RP). Even though Ed hadn’t noticed any changes with his vision, as it did not yet affect his active lifestyle or enjoyment of playing softball and racquetball, he still went in for further consult. It was through this workup that retinal specialists confirmed his ophthalmologist’s RP diagnosis. Once clinically diagnosed, Ed became involved with the Foundation Fighting Blindness, which connected him to a study at Harvard about a decade later. It was at a study visit that Ed immediately noticed his vision and age set him apart from the rest of the group who were experiencing more aggressive vision loss at a younger age. After taking a genetic test, a researching physician was able to definitively confirm what Ed was starting to suspect: Ed didn’t have RP, but rather he had a different inherited retinal disease (IRD) called choroideremia. As a practicing lawyer who established his own Pennsylvania-based practice in the 1980s, Ed tells his family members the same thing he frequently tells his clients: “The more information you have, the better prepared you are and the better chance you have to succeed.” He understands that knowledge of his condition allows him to be a proactive self-advocate in the years following his diagnosis. Ed says he’s learned over his many years of volunteer opportunities for multiple local Pennsylvania organizations and charities that part of advocating for yourself means leading with optimism and asking for accommodations when necessary. For example, those who work with Ed hold meetings earlier in the evening so that he can return home before it gets too dark outside. Ed never let his diagnosis hold him back from entrenching himself in the Pittsburgh community. Instead it has motivated him to prioritize the things that are most important to him. A big part of that is his family and how his diagnosis impacts them. Fortunately, science has come a long way since Ed’s diagnosis. Ed instilled in his daughter Angela a desire to always ask more questions to uncover more answers. Like her father, Angela is positive, kind and community-oriented. She intentionally focused her schooling to find out more about her family’s IRD and received her master’s degree in teaching the visually impaired. A mother of two boys, Angela learned that she was likely a carrier of her father’s genetic mutation that caused his IRD. Angela’s experience with her dad prepared her for when she began to notice signs of vision deterioration with her younger son. “Maybe I was more sensitive to it, having known my dad’s difficulties. We know when we need to help Dad, like when we’re going into a restaurant or something.” To Angela, being as informed as possible was something positive that came from her family’s journey. She began to notice that in addition to his poor central vision, then-5-year-old Dominic was having trouble with night vision, specifically when playing with friends or moving in and out of the car. The University of Pittsburgh Medical Center confirmed through retinal imaging what genetic testing would next confirm: Dominic has choroideremia, just like his grandfather. Angela developed a trusting relationship with their vision care specialist, so when he suggested that her older son Dante also undergo testing, she agreed. His tests confirmed the same, that despite having never experienced difficulty seeing, Dante also had choroideremia. “I wasn’t upset, but I was shocked,” Angela recalls. The entire family underwent genetic testing with the help of a genetic counselor in Pittsburgh so that their specific gene mutation “c.41delT” could be identified. Having this information put Angela in the best position possible to advocate for her sons. A teacher by trade, Angela knew she had to put a plan in place and find all the tools she could in order to help her sons succeed in school. For example, she went through the process of creating a 504 plan – which is a formal scholastic learning plan to support children living with disabilities to fit their individual needs – for Dominic, since he had already begun to show symptoms of his condition. However, Angela is confident that her sons’ vision won’t deteriorate to the degree that her father’s has because of her trust in the scientific community and her knowledge of evolving research and trial opportunities. “Our genetic counselor made it clear to me that nothing can be done down the road without the paperwork already in place, and testing creates that paper trail for my sons. Now, we’re first on the list when a trial or new resource is available,” said Angela. “We know what it is now, so let’s work with it and move forward.” In addition to Angela’s local community, she has been able to connect with others online because of her membership to the Choroideremia Research Foundation and access to their online community. Angela and Ed are amazed at the resources like this that are available to people in rare disease communities today. They encourage families at all stages of the genetic testing journey to seek support from one another, from health care professionals, and from the larger community.